49 tiles on a mesh sheet, each tiles measures 20x20x3mm. High temperature glass with an iridescent layer. Frost and UVA resistant. Cuts easily and cleanly. 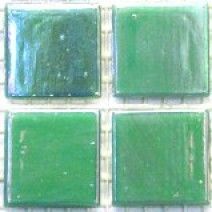 49 tiles on a mesh sheet, each tile measuring 20x20x3mm High temperature vitreous glass. Frost and UVA resistant.